From: Peterborough Evening Telegraph, p6, 10 August 1994. BACK from his annual lecture tour of America, the Guinness Book of Records science editor Brian J Ford arrived in time for the launch of his spin-off, the GBR Quiz Book. Just the job for the former King's School pupil, who lives in Mayfield Road, Eastrea. I spent an hour with him there once and came out bow-legged under the weight of information and opinion wittily poured out by this academic Niagara. No wonder he is in such demand by people like the BBC's Jimmy Young and John Dunn who want science explained simply. He's also had his own TV science series. That's not bad for a chap who didn't finish his degree course at Cardiff University, but is now a Fellow and sits on the Court of Governors. Reference books are full of him. When you read that his two most exciting moments were discovering microscopic specimens prepared in 1674, and meeting rock and roll king Little Richard, you will realise the breadth of his interests. The last time we met he cheered me up no end by 'saying health campaigns can cause stress'. This time he left me with another encouraging nugget: "Science makes the mistake of saying that if there is no evidence, it can't be true." Hats off to that. 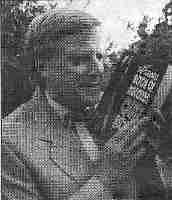 Move to the previous profile on this site: No problem for brainy Brian, 1994 or to the next cutting: Brian J Ford in Mensa at Cambridge, 1994.